My ears perked up when I heard the news that Mauro Perani, professor of Hebrew at the University of Bologna, has found what he believes is the world’s oldest complete Torah scroll. Perani was updating the University library’s Hebrew manuscript catalogue in February, when he realized the scroll had been wrongly dated by the last cataloguer in 1889. The 1889 cataloguer, a Jew named Leonello Modona, had described the letters in the scroll as “an Italian script, rather clumsy-looking, in which certain letters, as well as the usual crowns and strokes show uncommon and strange appendices.” Perani, however, recognized an elegant script whose square letters were of the oriental Babylonian tradition. The scroll doesn’t follow the rabbinical rules established by Maimonides in the late 12th century that standardized how the Pentateuch should be copied. It contains many features and markings that would be forbidden under those rules. Its script and other graphic notations are far older than the 17th century date that it had been assigned. Two separate carbon-dating tests — performed by the University of Salento in Italy and the Radiocarbon Dating Laboratory at the University of Illinois, Urbana-Champaign — confirmed that the scroll dates from 1155-1225 CE. Giovanni Garbini, a leading expert on ancient Semitic languages, said the discovery doesn’t change much about what the world knows about Hebrew manuscripts. “It’s an example of an ancient scroll, but from the point of view of knowledge, it doesn’t change anything,” he said in a telephone interview. But Stephen Pfann, acting president of the University of the Holy Land in Jerusalem and an expert in ancient Jewish manuscripts, said if accurately dated, the scroll is a rare and important find. “We don’t have anything much from that period,” Pfann said. I’ll admit that I’m not qualified or knowledgeable in this field, but I’d love to hear some of our Biblical scholars expound on Pfann and Garbini’s disagreement. I was surprised to read Garbini’s opinion that this discovery doesn’t change much. When an older scroll or manuscript is found, there are often changes to our understanding of scriptural passages. For example, just yesterday, June 2, 2013, Ha’aretz reported that a new interpretation of Genesis 9:22-24 has come to light due to a high resolution photograph of a fragment from the Dead Sea Scrolls. 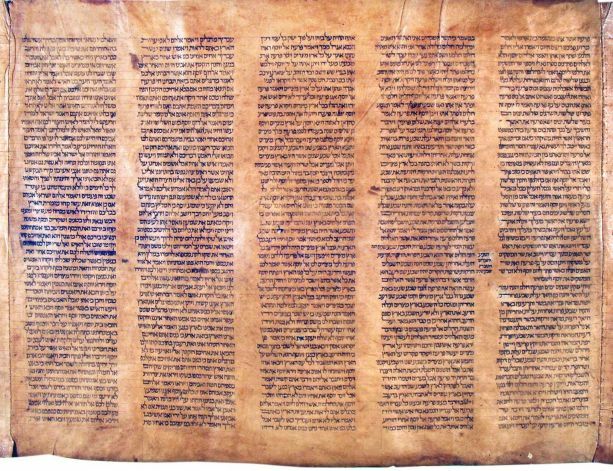 Though the Dead Sea Scrolls date from an earlier period of time than the Bologna Scroll, there is not a complete Torah among them. For many passages, the newly discovered scroll is going to contain the oldest version of them which is now known. What is the extent of the existing collection of Torah scrolls from before the time of Maimonides? What specific things were forbidden by Maimonides that were included in the Bologna scroll? What were the reasons for the Maimonides strictures? Have the graphic features, markings and script required by Maimonides made any difference in context or meaning? I deeply respect the Jewish approach to the study of the scriptures. It is said that simply stating an opinion about Torah without any background or training in how to critically think about the text is Torah discussion but is not necessarily Torah study. To encourage critical thinking, rabbis from at least the third century C.E. established a simple four-level system known as PaRDeS. Each consonant in this acronym stands for a Hebrew word, and put together they mystically form the word “orchard” (פָּרְדֵּס), or paradise.